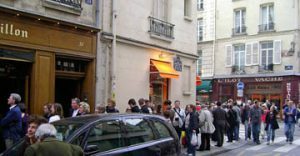 Sad, sad news for lovers of Paris and of the best ice cream available in the City of Light–and perhaps the entire world. 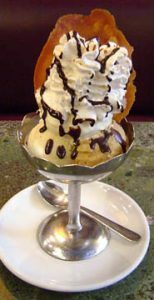 Raymond Berthillon, the founder of the famed Ile Saint Louis ice cream shop and next-door ice cream parlor that bears his name has died, the company announced on its website. He was 90 years old. 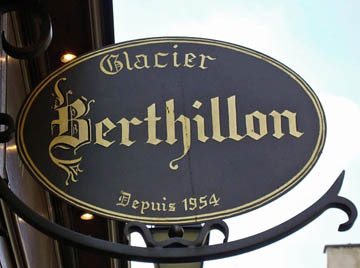 Berthillon sells both ice cream and sorbet in such unusual flavors as: (ice creams) coffee with whiskey, caramel nougat, salted-butter caramel (to die for! ), Grand Marnier, lavender, chestnut, gingerbread, honey nougat, and Earl Grey tea; (sorbets) apricot, violet, black currant, passion fruit, lychee, rose, rhubarb, and lemon-thyme. The products are all natural – no chemicals, artificial sweeteners or stabilizers – and are shipped to restaurants throughout the region. But the real treat is visiting the shop on the Ile Saint Louis. Hopefully, Berthillon’s tradition of making–and selling–top-quality ice cream will continue well into the future. Rest in peace, Monsieur Berthillon. The entire world mourns your passing. This entry was posted in Famous Paris destinations, Ile Saint Louis, Restaurants and tagged Berthillon by Bob Adams. Bookmark the permalink.